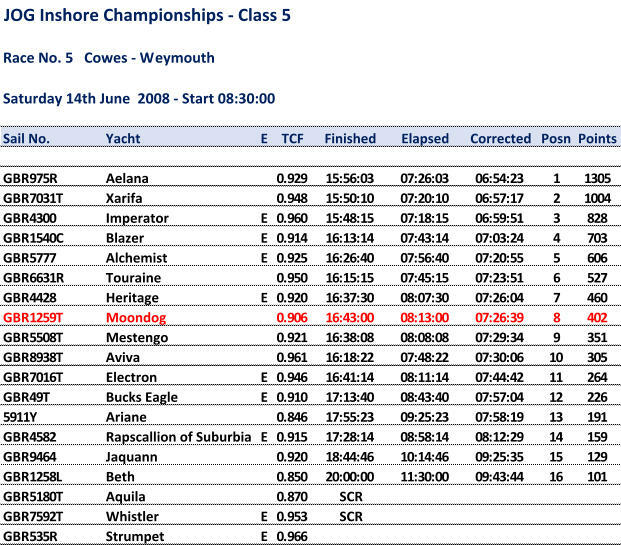 Close to being over the line on the start but got away with it and sheets eased down to the usual Lymington hole. Lost out a bit in Hurst Narrows to the leading boats with a dodgy tack and decided to stay off-shore as they had gone in. Looked quite good initially but further behind when we approached Anvil Point. Transgressed our own rules on sailing across Weymouth Bay and went in shore but could not get the boat going and ended up loosing out to the boats that went off shore who probably made the finish in one tack. Mid fleet finish but tried an alternative curry house to our usual one and found it to be very good (Weymouth Tandoori) so not all was lost.